The following 10 dos and don’ts are on how to respond to youth on immigration and Muslim ban. These recommendations are for teachers/educators working directly with students. 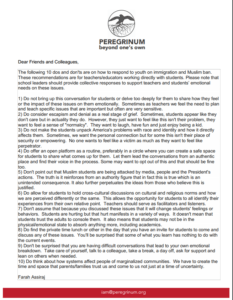 Please note that school leaders should provide co Peregrinum Dos and Don’ts for Immigrant Youthllective responses to support teachers and students’ emotional needs on these issues. Click here for the Do’s and Don’ts.